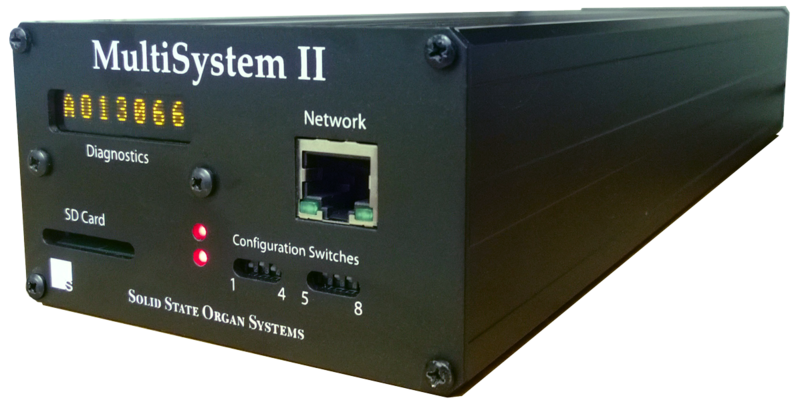 MultiSystem II is the core of Solid State's organ control. 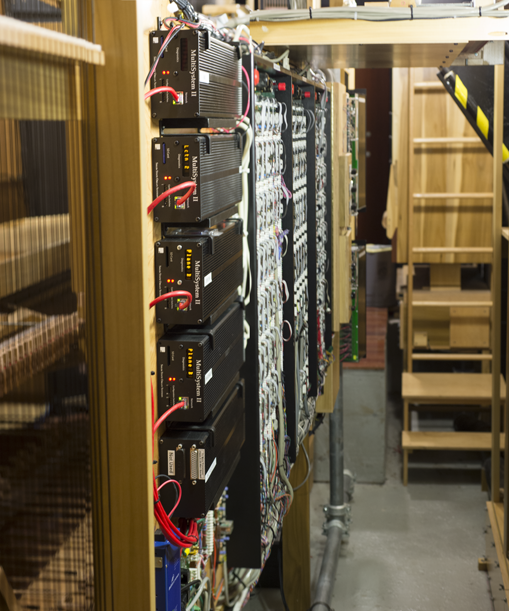 It is a versatile modular system that is used for the smallest practice organ and largest concert hall. The system is easily adapted to your needs by choosing the modules you need and then customising them with software we provide to configure them for your project. A MultiSystem reads the keys, stops and expression from the console and routes them to the correct chest drivers to play the organ. We have invested countless hours in precision crafting a custom processor which only knows one thing: how to move organ data from a console to a chest in the shortest possible time. By using a modular system we can assemble a group of specialist processors, each good at their specific task. Because of this the new MultiSystem transmits your performance to the instrument with crystal clear clarity, never adding to or subtracting from the original. CFM is the addon piston memory system for MultiSystem. CFM offers as few or as many memories for each piston as you need for the instrument. For larger systems you can divide up the memory into libraries to aid navigation. MIDI inputs and outputs are an option available on standard MultiSystem locations but if you wish to add MIDI stops to the console and control them then an MFM is the answer. This box simply adds onto the MultiSystem and can be controlled by the Organist palette. TFM brings optional wireless tuning control to MultiSystem. A simple to use app for iPhone or iPod allows you to work in the organ while selecting registration play notes and control the expression shades. You can setup tuning intervals and move through them with a Next button. No longer do you have to compromise between space on the console and features for the organist. The Organist Palette provides infinite space for all the controls you need to setup a performance or to aid with navigating memory levels on an iPad. Our performance recorder adds wire speed record and playback. Its superior performance overcomes the limitation of a MIDI wire but it still uses files that can be read in a MIDI editor. An optional iPhone app allows remote control from anywhere in the room and can also be used by tour guides. Our MultiSystem switching systems can be built with any number of inputs, outputs and stop controls. The system is configured in software which allows the for an extremely flexible structure and straightforward building blocks. A location is built from a processor, a plane (to put the cards on) and a choice of positive or negative polarity, input or output cards. The system is controlled by software which is loaded into each processor. The MultiSystem is built around high specification industrial processors that run a custom operating system designed for high speed real time processing. The total boot time is about 6 seconds and so the system is ready to run before the wind is up. Communication between locations is by CAT5 100BaseT Ethernet cabling. Although the protocols running on the cable are fully compatible with an Ethernet system we only support a closed network that is solely for MultiSystem use, this is because we can only guarantee performance if we know the amount of traffic on the network. It is possible to use a 802.11 Wireless network but again we cannot guarantee it will be to our performance requirements due to an inability to control external interference. Solid State pioneered the use of punch blocks in organ building, however we selected a high performance connector from a German manufacturer called Krone that has been in use in the European telecoms industry for 80 years and more recently was adopted for internet connections in large office buildings around the world. It has been used by us in organ building since 1991. MultiSystem operates between 12 to 36-volt as standard. The system itself uses less than 1 Amp to operate, however care must be taken in providing adequate current to switch the organ loads. 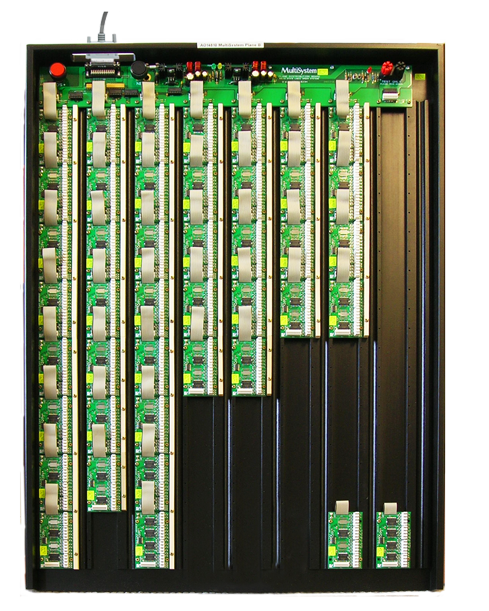 Output modules provide 16 outputs per module. 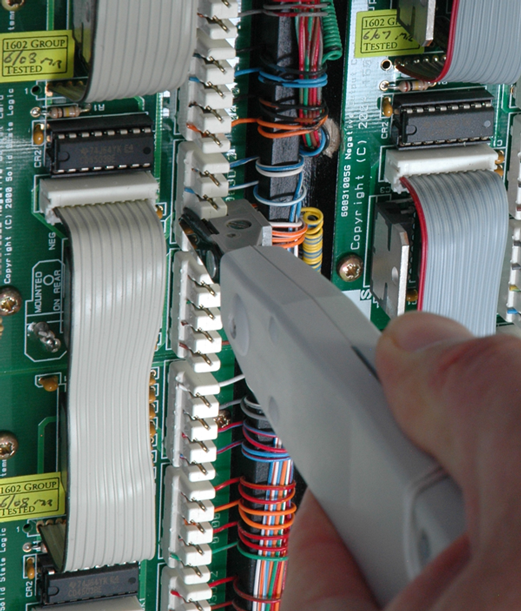 They are provided with Krone connectors to punch the wires directly to them avoiding an extra connector and hence increasing reliability. The module has built in suppression. Negative Output - 0.75A maximum rated. Equivalent to 16 Ohms at 12V or 32 Ohms at 24V. Heavy Duty Negative Output - 1.4A maximum rated. Equivalent to 9 Ohms at 12V or 18 Ohms at 24V. Positive Output - 0.1A maximum rated. Equivalent to 120 Ohms at 12V or 240 Ohms at 24V. Heavy Duty Positive Output - 1.4A maximum rated. Equiv to 9 Ohms at 12V or 18 Ohms at 24V. Positive Input - A high resistance input with built in surge protection and debouncing for dirty key contacts. The module loads the contact by less than 10mA and will accept inputs from 10 to 36V. Negative Input - The same specification but an alternate polarity.